Malnutrition is a condition that develops when the body does not get the proper amount of protein, energy (calories), vitamins , and other nutrients it needs to maintain healthy tissues and organ function. Poor eating habits or lack of available food may lead to malnutrition. Malnutrition occurs in children who are either undernourished or overnourished. Children who are overnourished may become overweight or obese, which may lead to long-term health problems and social stress. Undernutrition is a consequence of consuming little energy and other essential nutrients, or using or excreting them more rapidly than they can be replaced. This state of malnutrition is often characterized by infections and disease. Malnutrition intensifies the effect of every disease. Severe malnutrition is most often found in developing countries. Rarely in the United States do children suffer from severe malnutrition that is not related to severe chronic illness. Deficiency in one nutrient occurs less often than deficiency in several nutrients. A child suffering from malnutrition is usually deficient in a variety of nutrients. The leading cause of death in children in developing countries is protein-energy malnutrition . This type of malnutrition is the result of inadequate intake of protein and energy. Children who are already undernourished can suffer from protein-energy malnutrition when rapid growth, infection, or disease increases the need for protein and essential nutrients. In the United States, nutritional deficiencies have generally been replaced by dietary imbalances or excesses associated with many of the leading causes of death and disability. Overnutrition results from eating too much, eating too many of the wrong foods, not exercising enough, or taking too many vitamins or other dietary replacements. Nutritional disorders can affect any system in the body and the senses of sight, taste, and smell. Malnutrition begins with changes in nutrient levels in blood and tissues. Alterations in enzyme levels, tissue abnormalities, and organ malfunction may be followed by illness and death. Poorly nourished children often have weakened immune systems, thus increasing their chances of illness. Underweight, malnourished teenagers (such as those with an eating disorder) have an increased risk of osteoporosis and may not have menstrual periods. They may have heart and other organ problems with severe malnutrition. Malnutrition, if left untreated, can lead to physical or mental disability, or even death. Children who are overweight have an increased risk for long-term conditions and diseases, including cardiovascular disease, high cholesterol , high blood pressure, type 2 diabetes, asthma , sleep apnea, and certain cancers. Health consequences range from a higher risk of premature death to chronic conditions that reduce a person's quality of life. 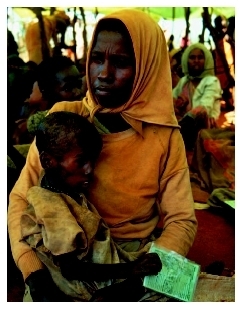 Malnutrition is a major cause of illness and death throughout the world. Throughout the developing world, malnutrition affects almost 800 million people, or 20 percent of the population. Approximately half of the 10.4 million children who die each year are malnourished. It often causes disease and disability in the children who survive. Diarrheal diseases are also a major world health problem, and may be a cause of malnutrition. Nearly all of these deaths occur in impoverished parts of Africa and Asia, where they often result from contamination of the water supply by animal and human feces. Worldwide, the most common form of malnutrition is iron deficiency, affecting up to 80 percent of the population, as many as four or five billion people. In contrast, children in many parts of the world are becoming increasingly overweight. What was thought of as a problem for industrialized nations only until recently, is now affecting children in developing countries. Approximately 25–30 percent of school-age children in the United States are overweight. Worldwide, poverty and lack of food are the primary reasons why malnutrition occurs. Families of low-income households do not always have enough healthy food to eat. When there is a household food shortage, children are the most vulnerable to malnutrition because of their high energy needs. There is an increased risk of malnutrition associated with chronic diseases, especially disease of the intestinal tract, kidneys, and liver. Children with chronic diseases like cancer , cystic fibrosis , AIDS , celiac disease , and intestinal disorders may lose weight rapidly and become susceptible to malnutrition because they cannot absorb valuable vitamins, iron, and other necessary nutrients. Children who are lactose intolerant have difficulty digesting milk and milk products, and may be at risk for malnutrition, particularly a calcium deficiency. Symptoms of malnutrition vary, depending on what nutrients are deficient in the body. Unintentionally losing weight may be a sign of malnutrition. Children who are malnourished may be skinny or bloated and may be short for their age (stunted). Their skin is pale, thick, dry, and easily bruised. Rashes and changes in pigmentation are common. Hair is thin, tightly curled, and easily pulled out. Joints ache and bones are soft and tender. The gums bleed. The tongue may be swollen, or shriveled and cracked. Visual disturbances include night blindness and increased sensitivity to light and glare. Children who are overnourished are visibly overweight or obese, and consume more food than their bodies need (or expend too little energy through physical activity). Overall appearance, behavior, body-fat distribution, and organ function can alert a family physician, internist, or nutrition specialist to the presence of malnutrition. Parents may be asked to record what a child eats during a specific period. X rays or a CT scan can determine bone density and reveal gastrointestinal disturbances, as well as heart and lung damage. Normalizing nutritional status starts with a nutritional assessment . This process enables a registered dietitian or nutritionist to confirm the presence of malnutrition, assess the effects of the disorder, and formulate a diet that will restore adequate nutrition. For children suffering malnutrition due to an illness or underlying disorder, the condition should be treated concurrently. Child suffering from the severe effects of malnutrition. intravenously (parenteral nutrition) or through a tube inserted into the gastrointestinal tract (enteral nutrition). Tube feeding is often used to provide nutrients to children who have burns , inflammatory bowel disease, or other long-term conditions that cause chronic malnutrition or malabsorption (e.g. cystic fibrosis or AIDS), and interfere with the ability to take in enough calories. This procedure involves inserting a thin tube through the nose and carefully guiding it along the throat until it reaches the stomach or small intestine. If long-term tube feeding is necessary, the tube may be placed directly into the stomach or small intestine through an incision in the abdomen. Intravenous feeding can also supply some or all of the nutrients these children need. Doctors or registered dietitians can help parents can monitor overweight or obese children. These professionals may suggest a weight loss program if the child is more than 40 percent overweight. Keeping weight gain under control can be accomplished by changing eating habits, lowering fat intake, and increasing physical activity. Some children with protein-energy malnutrition recover completely. Others have many health problems throughout life, including mental disabilities and the inability to absorb nutrients through the intestinal tract. Prognosis is dependent on age and the length and severity of the malnutrition, with young children having the highest rate of long-term complications and death. Death usually results from heart failure, electrolyte imbalance, or low body temperature. Children with semiconsciousness, persistent diarrhea, jaundice , or low blood sodium levels have a poorer prognosis. A good prognosis exists for overweight children who make lifestyle changes and adhere to a diet and exercise program. Every child admitted to the hospital for poor weight gain or malnutrition should be screened for the presence of illnesses and conditions that could lead to protein-energy malnutrition. Children with higher-than-average risk for malnutrition should be more closely assessed, and evaluated often. Proper nutrition is required to ensure optimal health. Consumption of a wide variety of foods, with adequate vitamin and mineral intake, is the basis of a healthy diet. Researchers state that no single nutrient is the key to good health, but that optimum nutrition is derived from eating a diverse diet, including a variety of fruits and vegetables. Because foods such as fruits and vegetables provide many more nutrients than vitamin supplements, food is the best source for acquiring needed vitamins and minerals. Iron deficiency can be prevented by consuming red meat, egg yolks, and fortified breads, flour, and cereals. Minerals —Inorganic chemical elements that are found in plants and animals and are essential for life. There are two types of minerals: major minerals, which the body requires in large amounts, and trace elements, which the body needs only in minute amounts. Vitamins —Small compounds required for metabolism that must be supplied by diet, microorganisms in the gut (vitamin K) or sunlight (UV light converts pre-vitamin D to vitamin D). Infants, young children, and teenagers need additional nutrients to provide for growth requirements. This is also true for women who are pregnant or breastfeeding; a mother's nutritional status affects her baby. Nutrient loss can be accelerated by diarrhea, excessive sweating, heavy bleeding (hemorrhage), or kidney failure. Nutrient intake can be restricted by age-related illnesses and conditions, excessive dieting, severe injury, serious illness, a lengthy hospitalization , or substance abuse. Children usually eat as much or as little as they need in order to feel satisfied. Children should be allowed to select what they want to eat among healthy food choices; they should be allowed to stop eating when they feel full. An underweight, overweight, or normal weight child should be allowed to decide how much to eat or whether to eat at all, within reason. Parents must proactively prevent childhood obesity by recognizing weight imbalances when they begin. They can help an overweight child to lose weight (if medically necessary) by being supportive, rather than scolding. Parents should offer their children nutritious food choices and encourage physical activity. With proper intervention, an overweight child is not destined to become an overweight adult, but weight loss goals should be realistic. Kleinman, Ronald E., and the American Academy of Pediatrics Committee on Nutrition. Pediatric Nutrition Handbook, 5th ed. Elk Grove Village, IL: American Academy of Pediatrics, 2003. Physicians Committee for Responsible Medicine. Healthy Eating for Life for Children. Hoboken, NJ: Wiley, 2002. Willett, Walter C., and P.J. Skerrett. Eat, Drink, and Be Healthy: The Harvard Medical School Guide to Healthy Eating. New York: Simon & Schuster Source, 2002. American Academy of Pediatrics. 141 Northwest Point Blvd., Elk Grove Village, IL 60007-1098. (847) 434-4000. American College of Emergency Physicians. 1125 Executive Circle, Irving, TX 75038-2522. (800) 798-1822. American College of Nutrition. 300 S. Duncan Ave. Ste. 225, Clearwater, FL 33755. (727) 446-6086. American Dietetic Association. 120 South Riverside Plaza, Suite 2000, Chicago, IL 60606-6995. (800) 877-1600. Food and Nutrition Information Center. Agricultural Research Service, USDA, National Agricultural Library, Room 105, 10301 Baltimore Boulevard, Beltsville, MD 20705-2351. Web site: http://www.nal.usda.gov/fnic/fniccomments.html. Mary K. Fyke Crystal Heather Kaczkowski, MSc. I am asking in regards to an infant who has had 2 liver transplants before 3 years of age, and was malnourished while awaiting surgery and after surgery. His first set of teeth were very badly deformed and his second set of teeth were also deformed. I was wondering whether the malnutrition while he was an infant could have caused his teeth to form in the gums abnormally due to a lack of calcium in his diet(small and odd shaped as though they were not complete sized teeth) and if this is related to the fact that he has problems with his sight since he was a small child. He is now 16 years of age and wears glasses and has abnormal and decayed teeth although he brushes every day and eats well. He has also been taking anti-rejection drugs since the transplants and other medications for his immune system. Thank you for your article and for reading my comments.